In the past couple of weeks Facebook and its content-monitoring policy as well as the changes made to its Trending Topics section made the headlines over and over again. These headlines have led to many opinion pieces and several debates around censorship, bias, and use of algorithms with all debates involving the question of Facebook within media. Facebook has repeatedly denied being a media company and have chosen instead to call themselves a tech company, as they don’t create content but connect people and give them a platform instead. However the news of the past weeks have brought back the debate and despite Zuckerberg’s announcement, the majority of the media world and the public seem to agree that Facebook has in fact become a crucial player in the media field. Let’s first take a look at the events of the past weeks. However this brings up questions: Who (or what) gets to decide these “values”? Next time a similar case occurs; will Facebook consider these values beforehand or wait for the public to protest online? Zuckerberg is called “world’s most powerful editor” but is he qualified? Doesn’t this show that Facebook needs to establish itself within the media environment and take on an editorial role in order to prevent future, similar incidents? Today, control over distribution is just as important as the creation of content and so Facebook needs to realize that a platform for 1.7 billion users which involves elements of media, comes with it’s responsibilities also. After all these instances, Facebook needs to admit the large role it plays in media and has to follow up with the responsibilities this brings such as journalistic principles, quality control, morality, accuracy, ethics and fairness. Can all this be achieved with an algorithm is another question. Coldewey, Devin. “Facebook Denies Bias in Trending Topics, but Vows Changes anyway.” TechCrunch. N.p., 23 May 2016. Web. 18 Sept. 2016. https://techcrunch.com/2016/05/23/facebook-denies-bias-in-trending-topics-but-vows-changes-anyway/. Gillespie, Tarleton. “Can An Algorithm Be Wrong?” Culture Digitally. N.p., 19 Oct. 2016. Web. 18 Sept. 2016. http://culturedigitally.org/2011/10/can-an-algorithm-be-wrong/. Gottfried, Jeffrey, and Elisa Shearer. 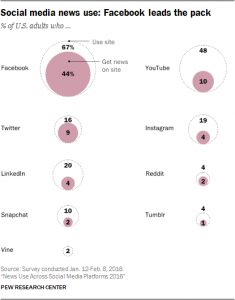 “News Use Across Social Media Platforms 2016.” Pew Research Centers Journalism Project RSS. N.p., 26 May 2016. Web. 18 Sept. 2016. http://www.journalism.org/2016/05/26/news-use-across-social-media-platforms-2016/. Gunaratna, Shanika. “Facebook Apologizes for Promoting False Story on Megyn Kelly in #Trending.” CBSNews. CBS Interactive, 29 Aug. 2016. Web. 18 Sept. 2016. http://www.cbsnews.com/news/facebooks-trending-fail-news-section-reportedly-highlights-fake-news-on-megyn-kelly/. Hansen, Espen Egil. “Hansen, “Dear Mark. I am writing this to inform you that I shall not comply with your requirement to remove this picture.” Aftenposten. N.p., 8 Sept. 2016. Web. 18 Sept. 2016. http://www.aftenposten.no/meninger/kommentar/Dear-Mark-I-am-writing-this-to-inform-you-that-I-shall-not-comply-with-your-requirement-to-remove-this-picture-604156b.html/. Nunez, Michael. “Former Facebook Workers: We Routinely Suppressed Conservative News.” Gizmodo. N.p., 09 May 2016. Web. 18 Sept. 2016. http://gizmodo.com/former-facebook-workers-we-routinely-suppressed-conser-1775461006. Thielman, Sam. “Facebook Fires Trending Team, and Algorithm without Humans Goes Crazy.” The Guardian. Guardian News and Media, 29 Aug. 2016. Web. 18 Sept. 2016. https://www.theguardian.com/technology/2016/aug/29/facebook-fires-trending-topics-team-algorithm. Tufekci, Zeynep (zeynep) “This photo headlined the New York Times, changed the course of the war. Would it be buried in a Facebook only world?” 9 September 2016. Tweet. Zillman, Claire. “Sheryl Sandberg Apologizes for Facebook’s Removal of ‘Napalm Girl’ Photo.” Fortune Sheryl Sandberg Apologizes for Facebooks Removal of Napalm Girl Photo Comments. N.p., 12 Sept. 2016. Web. 18 Sept. 2016. http://fortune.com/2016/09/13/facebook-sheryl-sandberg-napalm-girl-photo/.